Video is not the future of social advertising, it’s the present. Start making data-driven decisions in your social media marketing today with Socialbakers Analytics! I’ve previously written two blog posts on how Facebook has ousted YouTube from its site in terms of the volume of videos that marketers are uploading. And yes, the fact remains, the share of Facebook video posts exceeded the number of YouTube videos shared on Facebook for the first time in November, and the trend line shows that we may see 25K more native Facebook videos than shares of YouTube links January 2015. On the flipside, the overwhelming majority of Facebook video views are derived from one of the most game-changing features to how video is consumed, auto-play. It is no secret that measuring an auto-play "view” on a Facebook video augments the volume of views, due to the fact that a video is considered "viewed” if it plays for 3 seconds or longer. Although I agree this inflates the number of views, I can’t help but think that the "measurement debate” is irrelevant in the context of how social video sharing is reshaping advertising as we know it. Here’s why. Despite the 42% increase in US digital video spend in 2014, American television ad spend grew by 3.3% to hit 68.54 billion; a commanding number compared to the former’s 5.96 billion. By prioritizing video in the News Feed, Facebook is clearly looking to amass a larger portion of the digital video spend, especially with the ever-increasing demand (more on that later), but there’s also a longer term strategy to move more television dollars into their own pocket. But financial motivation (or better stated, advertising revenue) is not necessarily the only factor for the shift of video optimization in the News Feed. The micro-video trend supported by social networks like Instagram, Vine, or Snapchat video grew impressions at an alarming rate, which solidified one basic fact; the trend is no longer a trend, it’s an evolution in the way video is consumed. Create content that will leave an impression (in the literal sense) on the user and is somehow connected to your brand. And oh ya, you probably have between 1–10 seconds to do this…and with no sound. Actually capture the user’s attention to decide to watch the video. Again, no sound and only sometimes a title…makes the first 5 seconds of YouTube Skippable ads seem like a walk in the park. But if you can achieve both of the above, then you are going to be pleasantly surprised by the amount of attainable organic and paid reach. The Facebook algorithm currently prioritizes videos to make up 30% of the News Feed – this is not to mention the steep rise in the share ratio of videos posted. The result, once again, is that Facebook is rewarding advertisers that are producing content that its users find engaging and shareable while punishing the under-performers. Big surprise. So can we complain about Facebook optimizing the content type based on user demands? Not really. Especially considering their who-knows-how-old trademark of putting user experience above all else. Instead, I would focus on developing a scalable video content strategy at a reasonable cost because the prioritization of this content type is here to stay on Facebook and will no doubt expand to other social networks throughout the next year. Want to find out how best to measure engagement? We love data. That’s why we pored over 2015's key numbers to identify what every social marketer needs to know for 2016. 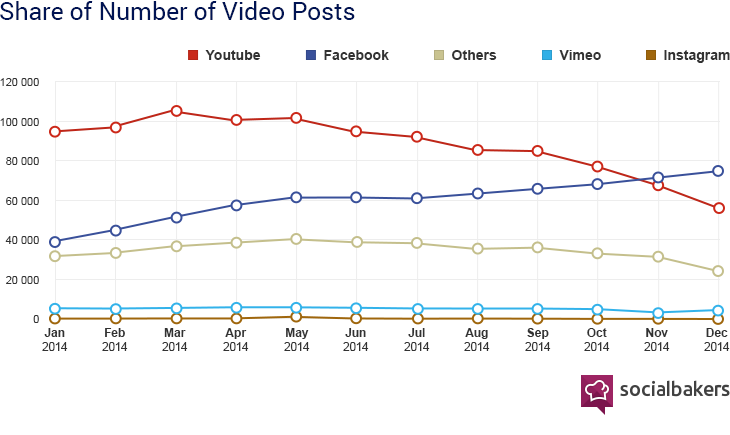 Videos are arguably the best content format for businesses marketing on Facebook. Why? They provide immersive experiences, personalize businesses, evoke strong emotional responses, and are a perfect format for the increasing number of users consuming content on the go.